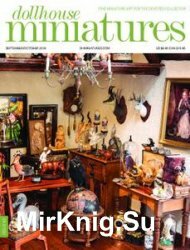 In this issue of Dollhouse Miniatures, read about the Cabinet of Curiosities, Nosferatu, a special auction of miniatures, Tudor Style Furnishings, and more. Learn how to make Glowing Pumpkins, a Modern Arm Chair, and Mini Lemonade amongst other projects. All this and more in the latest issue!